Life is about facing our worst fears. 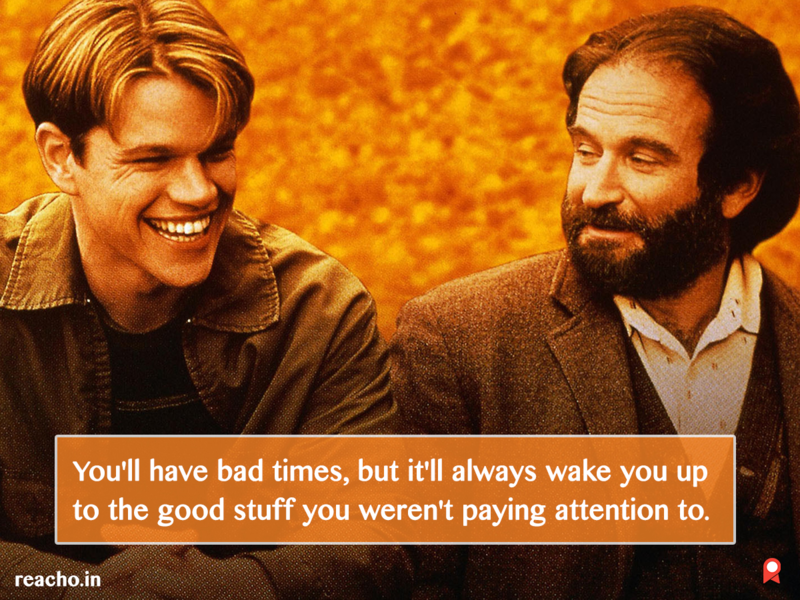 Good Will Hunting is definitely one such piece of stupendous storytelling. Nobody is perfect. We may overlook this fact. Life is about facing our worst fears. Some movies or stories showcase this sentiment with an enduring impact. Good Will Hunting is definitely one such piece of stupendous storytelling. We can instantly connect with the struggles of a twenty-year-old Will portrayed wonderfully by Matt Damon. Here are five quotes that still bring goose bumps, even nineteen years since the release of Good Will Hunting. We all will have our share of bad times. This gives another positive perspective of looking at those trying moments. We are very afraid of taking decisions, because we worry about future consequences. For Will, it is about his communication skills and failed relationships with people around him. Someone going through a bad patch tries to explain us what the person is facing. We generally try to shrug it off. Sean (Robin Williams) gets angry when Will is unable to understand what he is trying to say. There is always that one friend of yours, who thinks what you are doing with your life is not worth it. You seem to deserve much more. Chuckie (Ben Affleck) is that friend for Will. Nobody is perfect. We may overlook this fact while we judge situations. Sean (Robin Williams) nicely puts that into perspective.